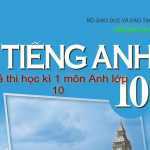 Thầy cô và các em tham khảo Đề thi kiểm tra học kì 1 môn Tiếng Anh lớp 10 có đáp án của trường THPT Nguyễn Công Trứ – Sở GD & ĐT Long An. Choose the word that has the underlined letter(s) pronounced differ­ently from the rest. Chọn từ có phần gạch dưới phát âm khác với những từ còn lại. Choose the best answer a, b, c, or d to complete the sentences. Chọn đáp án đúng nhất để hoàn thành những câu sau. 3. The book ……………… I need can’t be found in the library. 4. “Do you remember Mrs. Goddard, ……………… taught us English composition?” I certainly do. 6. Miss Lan Phuong loves working ……..children. 7. I……………… the money from him yet. 8. I ___- to the market with my mother yesterday. 9. If she ____ her car, she will get much money. 10. If I go shopping, I ……………… some food. 3. They have built this house. Read the passage and then answer the questions followed (1,5ms). 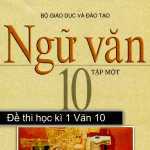 Đọc đoạn văn sau và trả lời những câu hỏi bên dưới (1,5đ). For the last few months I have spent every Saturday in my flat and have done nothing more exciting than work at home, read the newspapers and watch television. I had begun feeling bored with this, so last weekend I thought I would do something different. I rang up several of my friends and we decided to go to London for the day. I was really excited as I hadn’t been to London since I was ten. We decided to go by coach as this was by far the cheapest means of transport that was available even though it meant that we needed to get up very early. Once in London we decided to take a sightseeing tour as we wanted to see some of the famous buildings. After the tour we bought some sandwiches and ate them in a small park. In the afternoon, two of us went shopping and the others went to the theater. We met up again at 6:30 p.m. and went to a small restaurant in Soho. The meal was really good but, unfortunately, it took much longer than we had expected. We had to get a taxi back to the coach station. Luckily, we got there just two minutes before our coach left. 1. Where did the writer and his friends decide to go for the day? 2. What did they do in the afternoon? 3. How did they get back to the coach station? Topic 2: Write a letter (about from 50 words to 70 words) giving direction to Hau Nghia high school from Hau Nghia bus station. Students choose ONE of the four following topics and talk in 2 minutes. Topic 1: Talk about your family. Topic 2: Talk about advantages of TV or computer. Topic 3: What is your favorite job in the future? Topic 4: Talk about your school. Listen to the text, choose the correct answer. 1. Popffero used to be a ………… quiet town on the south coast of England. 3. They’ve also built a big ………. in the middle of the town. 4. The big trees on the two sides of the streets have been ……………..
5. The old corner shop has been replaced by a big …………..
6. Some people don’t like the changes because ……………..
a. They miss the life of the old town. b. They want to have the old corner shop. c. They don’t want to have new hotels. They said they would be in London the week after. She said she had bought the book the day before. This house has been built. 23 They decided to go to London. In the afternoon, two of them went shopping and the others went to the theater. 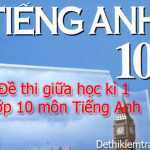 + Lá thư Vocabulary, content: acceptable words quantity, correct words, variety, etc. Nói – Content: clear, acceptable, relate to the topic.